For all their faults and struggles through the first eighteen games of the season, the Gators’ road trip to North Texas presented another opportunity for them to return to NCAA Tournament conversation. The idea was to build on the momentum they’d created with Tuesday night’s comeback win over Texas A&M by earning a road win over a far better opponent from the Lone Star State. As anybody who’s watched those first eighteen games could have predicted, they didn’t get it. Florida appeared doomed from the get go against TCU in the Big 12/SEC Challenge, allowing the Horned Frogs to casually trot out to an 18-3 lead twelve minutes deep into a game the Gators lost, 55-50. The loss puts Florida further on the wrong side of the so called NCAA Tournament bubble, at 11-8 with no real quality wins to speak of. Things could be about to get worse, too. 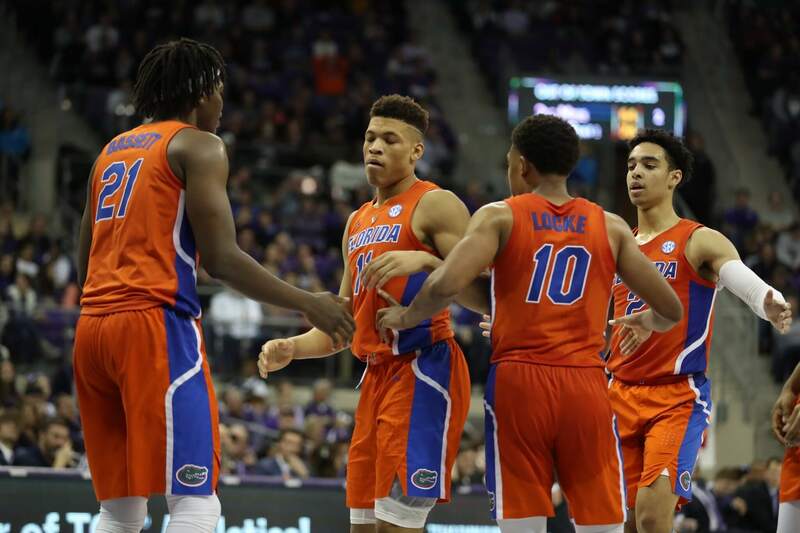 The Gators’ next four games are against Mississippi, Kentucky, Auburn and Tennessee, each of whom are currently safe bets to make the Big Dance, and each of whom figures to be a solid favorite against Florida. And even after that brutal four game stretch, the Gators still have two games against LSU and one more against Kentucky remaining. Each of those games presents an opportunity for the sort of statement win needed to vault Florida into the NCAA Tournament. But given the way the Gators played today- and so many other times this season- those games look more like future additions to their loss column. Because TCU attempted to give the game away, and Florida still lost. The Gators began the morning a biting-cold 1-15 from the field, plus seven turnovers in the first twelve minutes of the game. Somehow they recovered and forced ties at 34 and 36 apiece on a three from Andrew Nembhard and a layup by Kevarrius Hayes, respectively, the latter of which came with 12:23 to go. Then came one of their patented scoring droughts, as Florida went another five minutes without a single point while the Frogs rebuilt an eight point lead. Perhaps a sign of their own imperfection, TCU would go cold themselves with only a long two from JD Miller over the next five minutes to allow the Gators one more shot to fight back. And they did, clawing back to within 51-47 with four minutes to go. But then they totally collapsed, going literally scoreless over those final four minutes until Keyontae Johnson drained a three with :4.9 left. TCU’s Desmond Bane would convert two free throws after the obligatory foul following the inbounds pass, and that was that. Kouat Noi paced the Frogs with 22 points and six rebounds. On the other hand, KeVaughn Allen “led” Florida with eleven points, which would be a decent number for the ninth man on the team. Instead, he was the only Gator who finished in double figures. But Allen was the least of the Gators’ problems. For whatever reason, Florida just did not appear interested in competing. Mike White’s team seemed to sleepwalk through most of the game, closer resembling the statues outside the Swamp than scholarship basketball players. There was little, if any movement on offense, and because TCU’s defenders didn’t magically shrink down to nine inches tall or simply fall over, nobody got open. Predictably, most of the Gators’ possessions went nowhere, resulting in either bad shots (none worse than a Jalen Hudson airball with three minutes left in a four point game), lazy passes or avoidable turnovers. Making matters worse was the fact that TCU frequently went out of its way to try to help Florida, which is something the Gators would be wise to not count on going forward. The Horned Frogs committed seventeen turnovers and shot a miserable 18-50 from the floor. Jamie Dixon’s club also matched Florida’s cold front in the last four minutes of the game with one of their own, highlighted by Alex Robinson missing the front end of a one-and-one with :31 remaining and the Horned Frogs up four, but Allen then missed a rushed three and that was that. It’s at this point that the daily complaint about Florida’s lack of front court depth feels most appropriate to insert. The Gators were killed on the boards again today- because of course they were- by a 45-33 margin. But given how sluggish Florida was for the majority of the game, that’s a secondary concern. There won’t be a game the rest of the season where that isn’t an issue. When it’s combined with the type of complimentary ineptitude that Florida displayed today, it’s going to be hard for them to win another game.